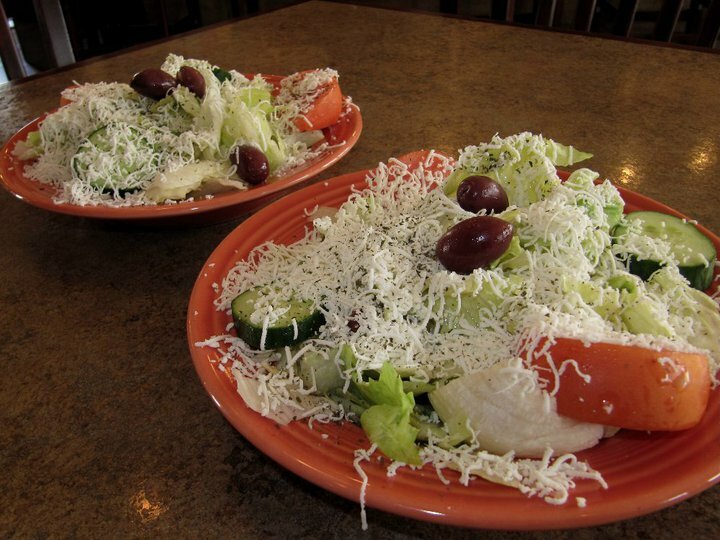 Crisp iceberg lettuce, tomatoes, cucumbers, olives, topped with fresh shredded feta cheese. Tossed with our homemade Lebanese dressing- a mixture of fresh lemon, oil, mint, and garlic (or, your choice of dressing). Fresh buffalo mozzarella cheese layered on sliced tomatoes. Served on a bed of lettuce and drizzled with our homemade Balsamic vinaigrette dressing. Finely chopped parsley, shredded lettuce, sweet onions, tomatoes, cucumbers and toasted Pita chips. Tossed with fresh lemon, oil, sumac and spices. Finely chopped parsley, tomatoes, cucumbers, and bulgur wheat. Mixed with fresh lemon, oil and spices. Shouf's Lebanese salad topped with french fries, shredded mozzarella cheese, and grilled chicken. Shouf's Lebanese salad topped with french fries, shredded mozzarella cheese, and gyro meat. Shouf's Lebanese salad topped with french fries, shredded mozzarella cheese, and cubes of lamb. Shouf's Lebanese salad topped with french fries, shredded mozzarella cheese, and filet mignon.